I am planning to go skiing in December. It's already October, and I haven't been conditioning. I love to ski, but every year it gets a little harder. I need an edge: I need to remind my muscles what they'll be doing on the slopes. So, I'm turning to yoga. Yoga, like skiing, can call on a particular muscle or muscle group to perform for an extended time. Yoga poses that activate those muscles and muscle groups will remind your sorry self what it's supposed to be doing when you hit the black diamond trails, cliffs, moguls, ice sheets, whatever is your thing. If you have a cold enough space, I'd work out in ski pants. If they don't stretch for yoga, they'll split on the slopes or worse, cramp your style. Don't attempt these poses if you've never taken a yoga class. As you can quickly tell from the pictures, I'm no yoga instructor, but I think these practices are going to help me on the slopes. I hope. Cat Cow. Extended Cat Cow (not pictured). OK, I always start with this to get some kinks out of my back and it warns my body that we're about to hold some yoga poses. Alternatively, you could probably start with 20-40 sit-ups and a few back stretches to get the blood flowing. Warrior I. I love the fact that my mother can hold this pose pretty well. She's been a terrific skier for 60 years and her legs are quite strong. Go deep (spread feet far apart). If that's too easy, go deeper. Protect your back from strain. Ten slow breaths each side. Preparations for Triangle. Look at how I move my hip here. Doing this with skis on is tremendously helpful for carving turns. Put your hand in the hip crease and watch it move. If you need help with this, find a qualified yoga instructor or skip it - don't wiggle your hips back and forth if you're not feeling it. Warrior II. Go deep. If you call yourself a skier, your feet should be at the far ends of the mat from each other. By now, your arms are saying, "what about us? We get a work out on the slopes, not to mention carrying skis, poles, boots, etc." Downward Dog. Stretch out those hamstrings. Pull your shoulders apart. Maintain the pose, get your hamstrings ready. Confess. You have probably adopted this pose many times while falling down the mountain. Try to keep your feet in place and walk your hands back. In ski parlance, this is "picking yourself up after a face plant" without having to roll around onto your back. Side plank. Ten breaths. Each side. Imagine poling through a mogul field. Chaturanga. or ladies chaturanga. Pushups where you keep your elbows in. Chair. I don't like doing this pose, so I do it last. Stick out your rear without arching your back. I put my hands forward as in a tuck. It's harder with your arms upraised, but who skis with their arms up in the air? Breathing exercises. Are you going to altitude? Are you going to ski until you gasp for breath? Hopefully, yes. Sit comfortably and do your favorite breathing exercises. Visualize replenishing your breath and congratulating your muscles on their hard work after a great day of skiing. I just made my first batch of hamantashen dough to make cookies for Purim. As usual, I popped a nut-sized ball of the delicious cookie dough in my mouth and the sugar rush hit me like a shot of Tequila. Judaism is not about food. It's about sweets. Think about it. Moses lured them out of Egypt with promises of milk and HONEY. But seriously, Hanukkah has its chocolate gelt, Passover, fruit slices and macaroons. Shavuot - cheesecake, Rosh Hashanah, apples and honey. Even Shabbat has supercharged Manischevitz wine and cookies at the oneg. Personally, I appreciate these sweets. I really do. But for my money, there's nothing quite like Hamantashen cookie dough. (Empty bowl pictured below). 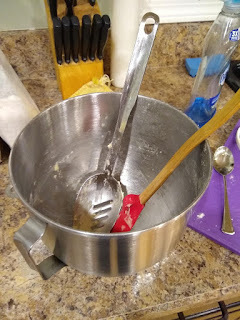 Here's the recipe for the cookies, although I haven't made the final product yet this year (my dough is resting until I pick up some filling) and so I can't send luscious cookie visuals. Gluten Free, Dairy Free, Thanksgiving! Let's see -- Sorry no pictures, I was too busy cooking! Use a Kosher turkey and it's already brined. I use the Joy of Cooking recipe for brined turkey, basting it with olive oil. Roast upside down on a rack for 2 hours at 350F (for 15 pound bird) then flip it to right side up for the last 30 minutes. Could it get any easier? Martha Stewart boils sweets with the skins on, and so do I. Buy fresh sweet potatoes, cut off strings, anything not perfect. mini marshmallows (if that's your thing). Polio. In my mother's generation, everyone knew people who died of polio. My aunt had polio and she walked in a funny way, with a limp, because of the polio. The president of the United States had polio. When the polio vaccine came out, everyone vaccinated their children because no one wanted anyone to get polio. You vaccinated your children to keep them safe, and to keep the country safe. People remembered not only who got polio, but they remembered the line of transmission. Jim had it, and gave it to Joe, and Joe died. They remembered that bad as it was to get one of these diseases, it was worse to get it and pass it on.